Introduced in our Cruise 2019 presentation, this highly versatile bag can be carried as a backpack, a messenger or a tote. 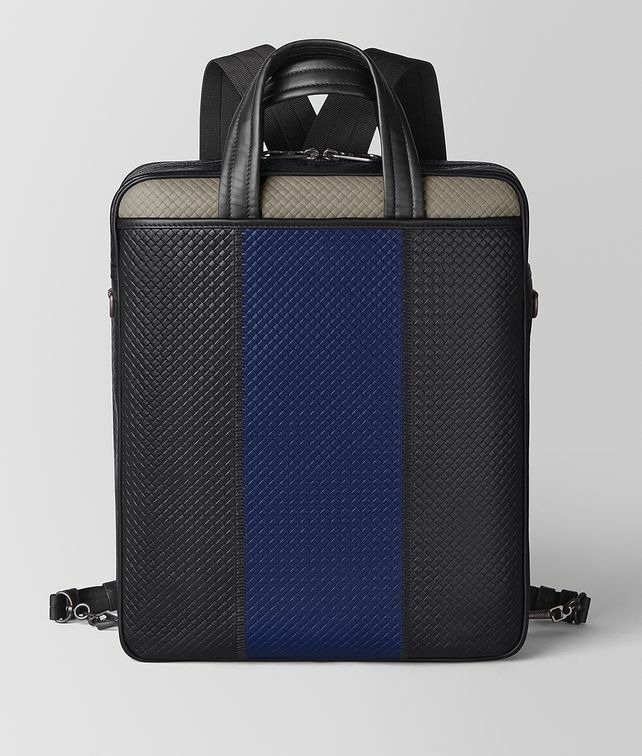 It is crafted in the Micro Intrecciato workmanship, which features panels of colored calfskin, embossed with a woven texture and hand-stitched for a uniquely graphic look. There are two external pockets, both with button closures, while the interior features a flat, padded compartment for high-tech devices and a double smartphone holder. To wear the bag as a backpack or a messenger, adjust the shoulder strap and tuck the top handles inside the external pockets; to carry it as a tote, tuck the shoulder strap inside the external pockets. Height: 37.5 cm |14.7 "
Width: 30.5 cm | 12"